Send your best wishes with an assortment of flavors. Approximately 16 inches h x 14 inches w. Based on season and availability this selection may contain: beef sausage, gourmet mustard, brie cheese, crackers, individual tea, wafers, apples and oranges in a willow basket. Exact basket and fruit/gourmet selection may vary by season and delivery location. 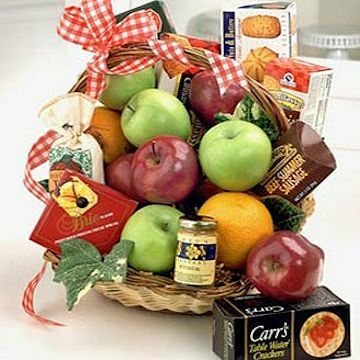 This fruit and gourmet gift basket has been purchased most frequently by our customers for the following occasions: Sympathy, Get Well, Christmas, Birthday, and Thank You.